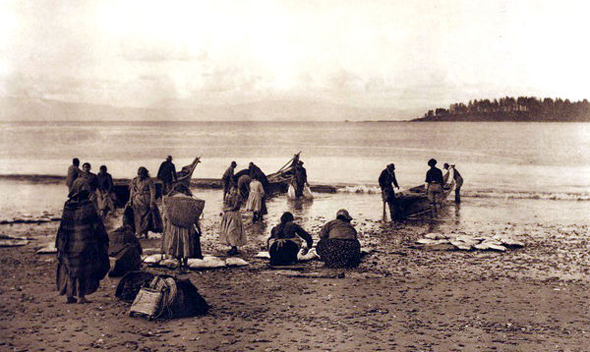 Nuu-chah-nulth people with dugout canoes on the West Coast of Vancouver Island. For thousands of years, First Nation fishermen on the West Coast of Vancouver Island went out to sea in small dugout canoes to search out and catch salmon using baited hooks and hand lines. While some things have changed, there is no denying that the culture and economy of the region is still intrinsically linked to salmon harvest. The aboriginal people of the region, known as Nuu-chah-nulth, were the first commercial troll fishermen in B.C. Later, European immigrants became involved in commercial hand lining from rowboats and skiffs, and also introduced gasoline-powered vessels in the 1900s. The gasoline-power boats had two tall trolling poles, spread open at the top forming a V, wich allowed multiple lines to be pulled behind the vessel at low speed (about three knots) without being tangled. In the 1930s, fishermen began to take ice in their holds, allowing them to troll farther offshore and to stay out for several days. By the 1960s, fishermen began installing compact freezing systems aboard their trollers to freeze their catch at sea, extending their trips even further. By the 1980’s, the B.C. troll fleet consisted of approximately 1,600 vessels, a mix of freezer, ice and day boats. However, by 2000, the West Coast troll fleet had been downsized to 544 boats as a part of a government buyback and licensing scheme. Nowadays, modern trollers can have as many as 120 lures in the water at once, at depths of 10 to 60 fathoms (60 to 360 feet). 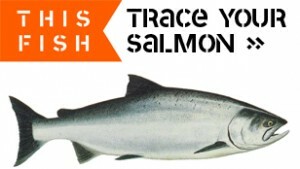 Fisheries occur in the summer for Chinook and Sockeye, and in the winter for Chinook. Commercial troll fishermen are very independent. This independence is apparent as fishermen own their own boats and licenses. Vessels average 40 feet in length and have either a small crew, who are often family members. Some skippers even fish alone. Fish are delivered to landing stations run by a few small fish buyers. This entry was posted on Saturday, January 1st, 2011 at 10:09 pm	and is filed under TROLLING and tagged with history, nuu-chah-nulth, trolling. You can follow any responses to this entry through the RSS 2.0 feed.